Since the Fokker is E-AB, there are no restrictions in regard to complying with STC's. The builder is free to use whatever means for covering the airplane he desires. My previous covering experience has been with the Poly Fiber (Stits) system but I decided I had no interest in once again enduring the noxious fumes that solvent-based system emits. I intend to paint with latex paint so the water-borne Stewart Systems adhesive seems to be an ideal complement. Because there is no significant odor with the glue, and the paint will be applied without spraying, I can cover and paint indoors during the winter without fumigating the house. I found the system very easy to use once I got the hang of it, and it is wonderful to not deal with aggressive solvents. Clean up is with water and adhesive easily rubs off my hands. And there is no smell! The customary hobby and clothing irons are sufficient for setting the glue and shrinking the fabric. I'm using uncertified 2.7oz Dacron from Aircraft Spruce along with Dacron pinked tapes. I spent about a day on the rudder while learning the system. The horizontal stab is going much quicker. A nice feature of this system is not having to use bias tapes. 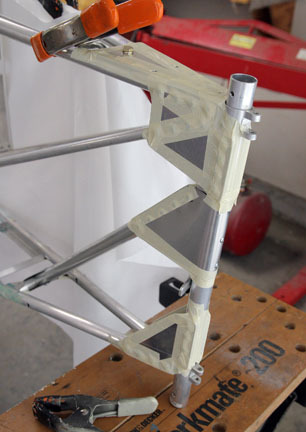 Because the glue allows tapes to be tacked into place prior to full attachment, regular tapes can be shrunk with the small iron around small radii. 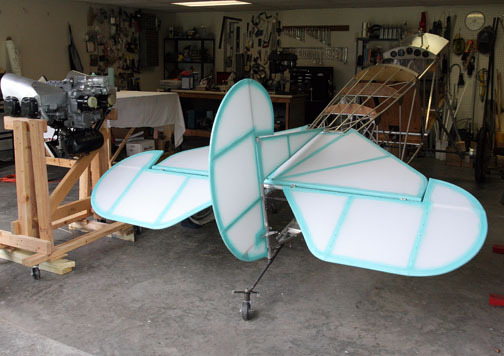 AA planes customarily use flange-head rivets to secure fabric to flying surfaces. I didn't like the idea of drilling out rivets and leaving the remains in the rib tubes if it was ever necessary to repair fabric. The labor-intensive traditional method of stitching was considered, but I decided to split the difference and use stainless #4 truss-head screws in lieu of rivets. 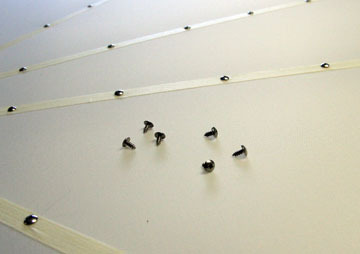 These can be easily removed if fabric ever needs to be replaced and are nearly as fast to install as rivets. 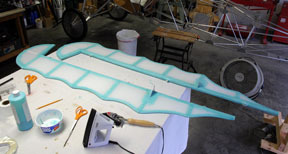 The first surface I covered was actually the little vertical stabilizer. It was a good place to learn the Stewart System because of its size and simplicity. This first attempt went fairly well but after seeing how nicely the rudder came out I decided to recover the vertical stab. As it turns out, I was destined to redo the vertical stab regardless. 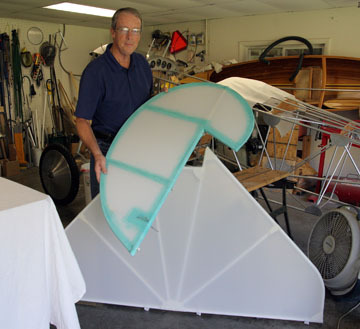 After covering the rudder I put it and the vertical stab on the plane and found that when the fabric on the rudder was shrunk, the balance horn was distorted just enough to close up my carefully fabricated gap and cause interference between it and the vertical stab. It was interesting to see how aggressively the fabric was bonded to the vertical stab. I cut slits in the fabric and only with great difficulty was able to wrestle the fabric from the tubing with help from a utility knife. There is no way the fabric could have come loose in flight. This was a confidence-inspiring exercise and demonstrated the shear strength of Ekobond even though it was applied during a builder's first attempt at using this system. The stab was rebuilt by drilling out rivets and relocating the top tube. Clearance has been restored between the two surfaces and confidence established in the integrity of Ekobond. Technique has been per Stewart's videos and has worked very nicely. 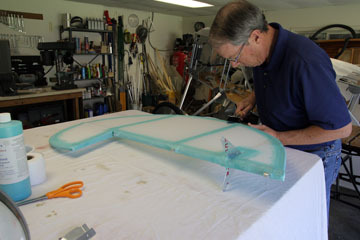 Ailerons covered. Covering the scalloped trailing edges is....interesting. 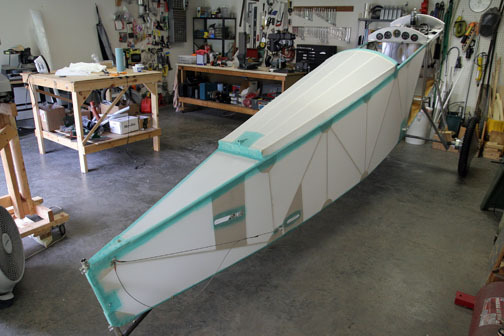 One last look before the fuselage gets covered. 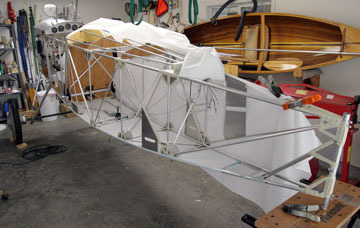 Masking tape was applied to edges of gussets and over rivets to prevent chafing of the fabric. Bottom and both sides of fuse covered. Full shrink of Dacron is achieved at 350F. However, I have seen a couple of instances of tubing distortion at 250F. This occurred on the elevator and the upper fuse longerons in front of the tailpost. I am going to limit shrink to 250F in order to prevent further distortion. Dacron is 2.7oz, perhaps the lighter 1.8oz might allow full shrinkage without distortion. But 250F yields a taut surface and I'm content to stop at that temp. The seventh month of the project marks the completion of fuse and empennage covering. 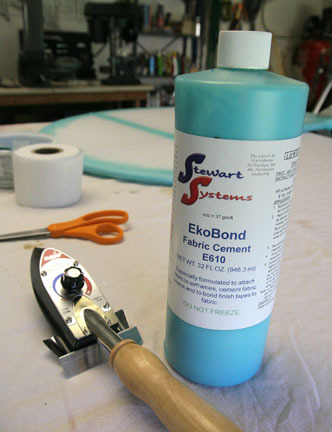 One quart of Ekobond has been used thus far and I continue to be pleased with the Stewart Systems product. It adheres tenaciously yet allows for easy repositioning and cleanup with no fumes or smell.